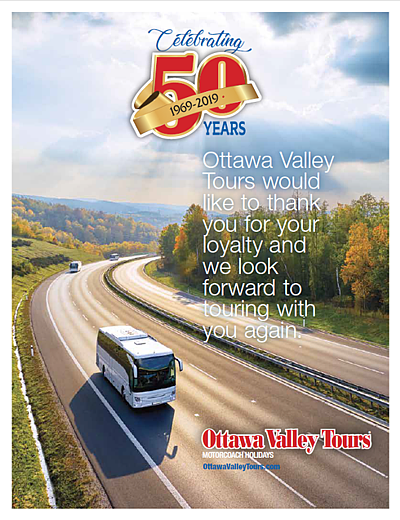 Ottawa Valley Tours is a leader in Motor Coach Holidays operating out of the Greater Ottawa-Carleton Region, the Ottawa Valley and Eastern Ontario. For 50 years we have been specializing in packaging scheduled group tours. We offer a selection of one-day tours and multi-day holidays throughout Canada and the United States including “No Fly” cruises to Bermuda, the Caribbean and the Canada & New England Coast. We also provide custom packages for specialized groups. Our long-standing membership with the Ontario Motor Coach Association (OMCA), Motor Coach Canada (MCC), and the Travel Industry Council of Ontario (TICO) ensures we are educated and current with the latest industry standards and trends. We select the best destinations and tour inclusions to ensure a comfortable and worry-free holiday. Enjoy a touch of luxury in a deluxe modern motor coach designed with large picture windows for the ultimate view and high back seats and foot rests for the greatest comfort. Air ride suspension, air-conditioning, washroom facilities, video and stereo/CD system and a friendly bilingual driver are also provided for your enjoyment. A trained professional tour director accompanies all of our tours to ensure your safety, comfort and enjoyment. Our knowledgeable, efficient and friendly travel specialists in our office are dedicated to assisting you in making your travel arrangements a pleasurable experience. Our strong commitment to customer service and quality tours allows us to maintain our existing customers while building new customer relationships. Sit back and Discover - All that’s missing is you ! 2. Finally YOU can see the sights.